Formal wear for me has always been black trousers + white blouse + coloured blazer (more on that in another post). But this time I decided to do something new. 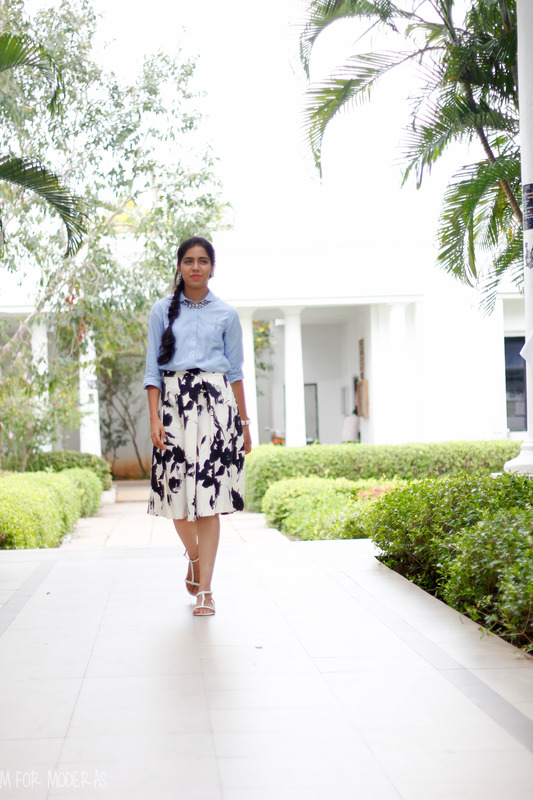 This printed skirt is one that I first set eyes on in a Zara in Mumbai. I never got my hands on it until later, but I fell in love with it the moment I saw it. Deciding to think about it for a while, I didn’t buy it on impulse. It didn’t get out of my head, so I took it as a sign and bought it two weeks later. The styling is inspired by a woman I saw on the road in Italy– street style is the best in Milan, where everyday outfits are styled impeccably. And since a Zara item in Italy is the equivalent of a kurti from Lifestyle in Chennai, I invariably saw this skirt on a woman in Italy, where she wore it with a powder blue shirt and sunglasses. My favourite white ankle strap sandals + sparkly necklace finish the look out. Ankle straps and midi (knee and below) length skirts go very well together, so I wore the flats. Powder blue ankle-strap heels would also be a great pairing. Simple gunmetal coloured accessories– the earrings and necklace are the same metal, keeping it coordinated. A pop of colour from the pink lips (it’s become a trademark!) keeps the outfit light. 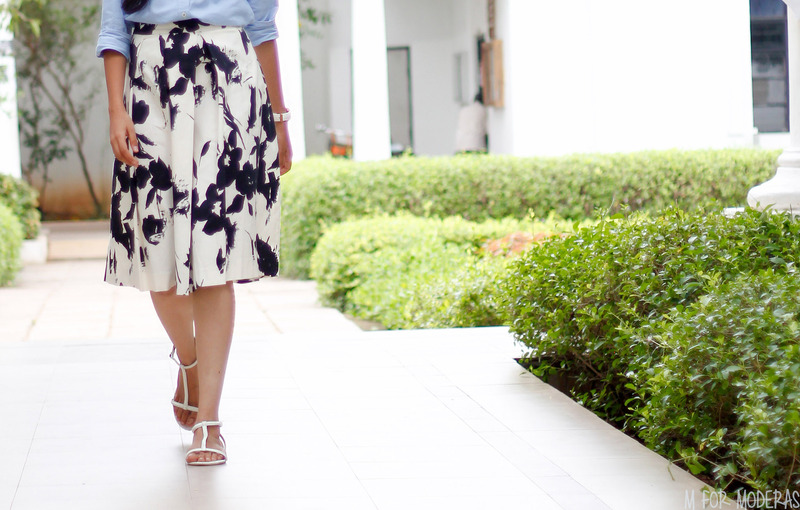 The full tuck of the shirt allows the flare of the skirt to shine. Can I just say I love the flounce of this skirt so much? It’s one of my favourite buys this year. I can’t wait to wear it more. The practical length + playful silhouette + not-too-trendy print make it perfect for all seasons and occasions. Investment well made. Powder blue is also a new classic colour that I think everyone should buy. 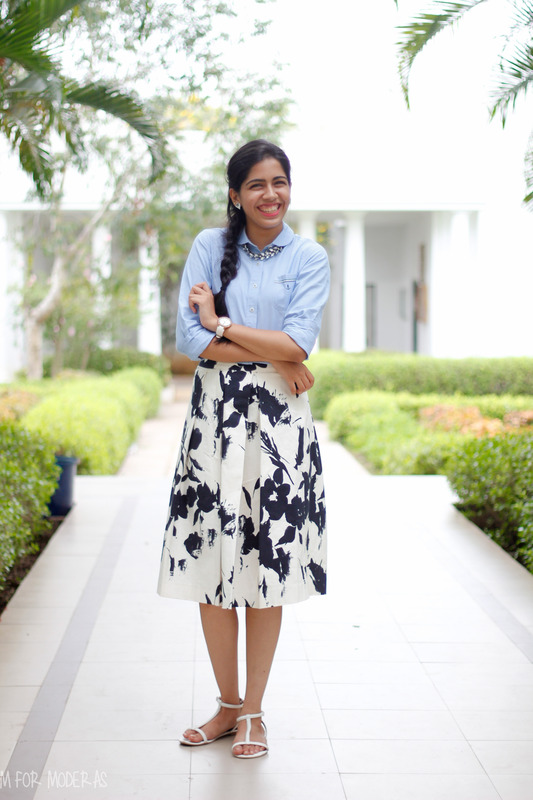 It pairs surprisingly with almost every neutral, and is the perfect base to build outfits on. 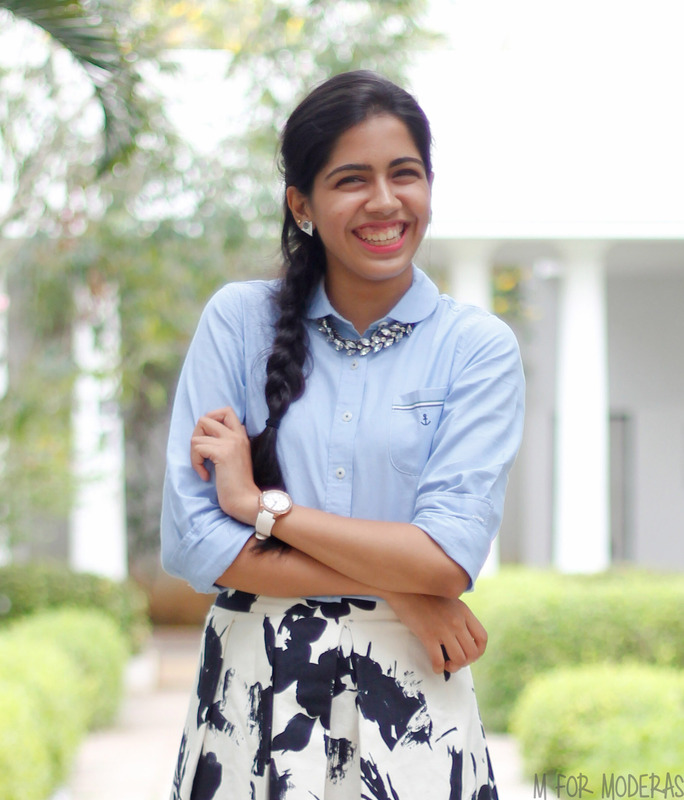 Here, the plain shirt is a classic, paired with a graphic print. 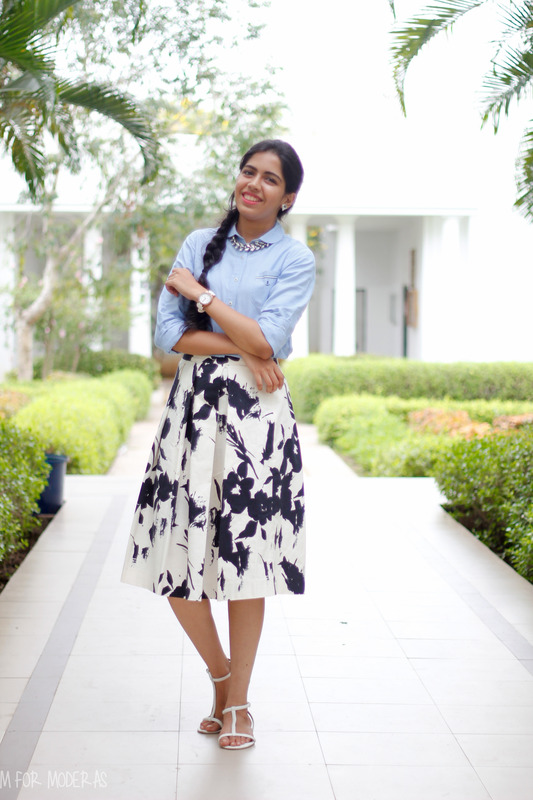 Wearing: Shirt from Bangkok, Skirt from Zara, Sandals from H&M, Necklace + earrings from Forever 21, Watch from Hilfiger. Lipstick is Givenchy Le Rouge in Rose Dressing. I absolutely love, love your blog! It’s totally awesomesauce! At a risk of sounding creepy, I have to say that I’ve seen you somewhere in this outfit. Was it at some Chennai MUN in August or September?